The geophysics students have given their final presentations and gone home. I'll be finishing up a couple of posts (mostly waiting on graphics) about their last weeks of work and a few interesting study areas, but for now we will break from geology. The geologists will be doing geophysics for the next few days (hence I'll still be in Cañon City), but now I'll have slightly more free time to do some photo experiments! Saturday night another TA rushed in to tell me that the milky way was out and nicely visible. I grabbed my camera, but sadly the moon was rising and it was hard to get great shots. 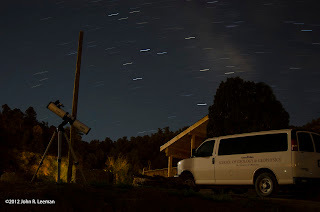 The wind was gusty, but a moon shot turned out okay, and we staged a photo with the dining hall, OU vans, and star trails. Look for more geology posts in the next few days before I depart for my desert loop on the way to Arkansas. Week 2 of camp for the geophysics students was at the new University of Oklahoma Bartell Field Camp. Students were split into three groups and each group rotated through three main geophysical methods: gravity, magnetics, and ground penetrating radar (GPR). I was responsible for the GPR all week, but we'll briefly discuss everything they did and some problems we had along the way. Monday the students went on an intro field trip to learn about the geology of the area. First students walked up the road to 'high camp' noting the sediment basement contact (and what we interpret as a large fault breccia) on the way. When into the granitic basement there are many mafic dikes, some locations even have dikes crosscut by later intrusions. The students this year really seemed well prepared to tie the geology into their reports and were very careful in noting/interpreting features. Next we drove to Tunnel Drive, a short hike that exposes lots of basement deformation and some classic fault examples. There were also a couple fun stops like Skyline Drive where dinosaur footprints have been preserved as trace fossils. In the picture below we are looking up at the bottom on an impression likely left by a foot of an ankylosaurus. The next three days the groups rotated through the geophysical methods. In this post I'm only going to discuss the GPR collection and data. The gravity data is currently being processed (so expect a post about it early next week) and the magnetics are posing problems. Our main magnetometer has an internal problem that prevents us from downloading the data collected. It is being sent back to the factory and the students will collect new data with an older system next week. There is also a special magnetic surprise I found in an outcrop that I want to discuss in a more detailed post. Ground penetrating radar is a technique we haven't really used much recently at OU, but I'm hoping to make a come back with it! The system needed lots of tweaking, adjusting parameters, and fiddling with; after that it obtained some really interesting data. 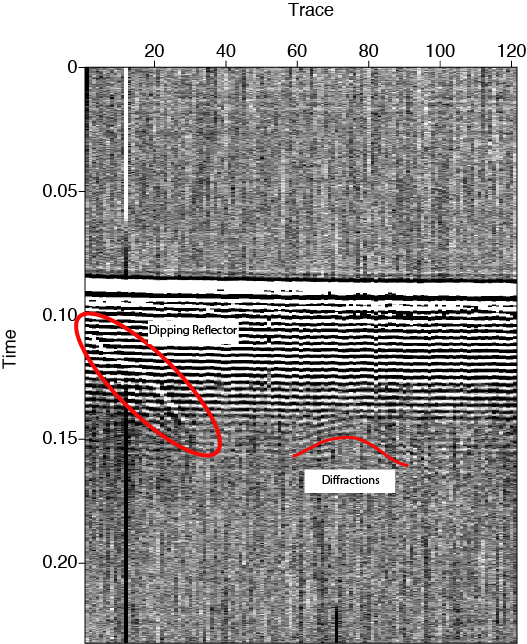 A ground penetrating radar sends a signal into the rock, which is reflected from various objects/interfaces, so data is interpreted similar to seismic data (only at a different time scale). 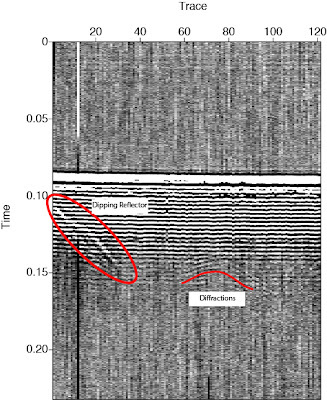 Seismic waves travel through rock at around 2200km/second while radar waves are much faster at about 0.1m/nanosecond. GPR is used extensively in archeology to look for near surface targets and to find bodies during criminal investigations (we have in fact used this system over a mass grave before in Norman... but that's another post all together). The first day we had students experiment with different parameters over a known target (a metal culvert under a road). While the target isn't necessarily geologic, we know what it is, where it is, and how big it is. Using this we setup an ideal parameter set to then examine more interesting geologic features. Other groups during the week also targeted the culvert for practice, then picked more interesting areas to examine. First I had to patch together some codes to convert the GPR data from the proprietary DT1 format to a more standard SEGY format. We then worked up some seismic unix command flows to process that data. The images shown are not migrated and could benefit from migration, spiking deconvolution, etc. The first image shown is on the high camp road. There was a culvert near the surface, but below that are other diffractions from some interesting geological structures. I'll currently not say any more so students can think about what these are. The second image shows why this tool could be so valuable. There was little geology at the surface, but according to the data there is a dipping reflector just under our feet. What could it be? Maybe with a few more trips up there I'll be able to find it in outcrop somewhere. There were also some diffractions deeper in this image. While I do have lots of comments about the GPR parameters, setup, etc I don't think it's so important to discuss. My goal is to show that there is so much beauty in the complexity of what happened here. The basement rock is very very old (without an extensive literature search we'll say pre-cambrian, which is ~540 Million years ago). Friday we took the students on another field trip. Early in the morning I had to take our other TA, Cullen Hogan, to the airport. He is leaving us for an internship and will be greatly missed in the last week of the course. After returning from the Colorado Springs airport the students piled in to drive to one of my favorite views in southern Colorado, Spiral Drive in Salida. On the way to Salida from Cañon City small sedimentary 'hanging basins' can be found in the mountain sides as we drive through a thrust zone between sediment and basement. Salida lies in the San Lúis Valley, part of the slow Rio Grande Rift. The view is always amazing and some complex geology is observed on the way. Below is a panorama overlooking the collegate peaks I took at this location last year (there wasn't as much snow this time). For the next 3.5 weeks I'll be a teaching assistant for the University of Oklahoma geophysics field camp. The point of the camp is to teach senior geophysics students how field data is collected, processed, interpreted, and applied to the problem. This is an important capstone class because prior to now students just see geophysical data as equations, numbers, and options in software and on paper. Now they must hike in the field, observe the geology, collect the data, and finally figure out what it all means. Week 1 was done in Norman, OK back at the school. Monday the students listened to lecture on geophysical methods, were introduced to the equipment, and finally were tasked with using differential GPS on the North Oval of campus. Differential GPS is much more sophisticated than the GPS in your car. Each unit costs ~$80,000, and one is mounted on a tripod and remains stationary throughout the day. This station is referred to as the base, and is the most crucial link in any geophysical survey. The second station is mounted in a backpack and is the rover. Students walk around with the rover collecting data points, then at the end of the day the base station is used to calibrate the rover data. We know the base station doesn't move during the day, but it appears to in the data. This is because GPS locations are highly susceptible to changes in atmospheric humidity, irregularities in the satellite orbits, and a number of other factors. Without going into more detail, look below at the Excel plot of the oval before and after correction. Data points are much closer (within centimeters) after correction, and those centimeters make all the difference in some survey environments. This plot came from one of our students reports that was turned in during the week. The next objective was to collect a seismic line over a branch of the fault system that slipped during the earthquake sequence of November 2011 in central Oklahoma. Setting out a seismic line is a long, arduous task, so the students needed a practice day. We setup a short (~300m) line by the school's duck pond. Below is a time-lapse video I took of the practice session on Tuesday. The next two days were collecting the real data in Prague, OK with Friday reserved for processing. Without going into great detail of how we setup and collected that data I'll say that 72 geophones were deployed every 10m. Geophones are small seismometers effectively that only measure the motion of the ground in one direction (up and down in this case). After processing the data we get an 'image' of what's going on underground. Are the rocks bent (folded), broken (faulted), or otherwise layered/interesting. We expected to cross the branch of the fault responsible for some of the stronger aftershocks. 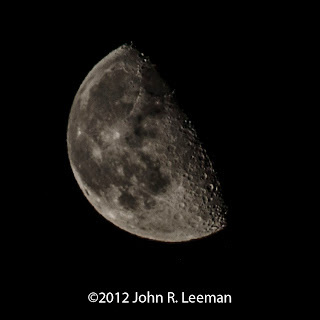 Below are some of the processed images from a student. This is a rough processing and can be improved with more time, but that is beyond the scope of what is expected in the field. 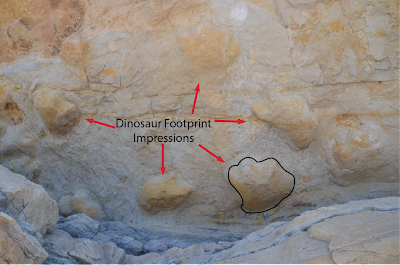 The faults are marked by yellow lines and indicated places were the rock has broken and slipped. Also notice the folded layers to the left of the section. More work and interpretation is needed to obtain further geologically useful interpretations. 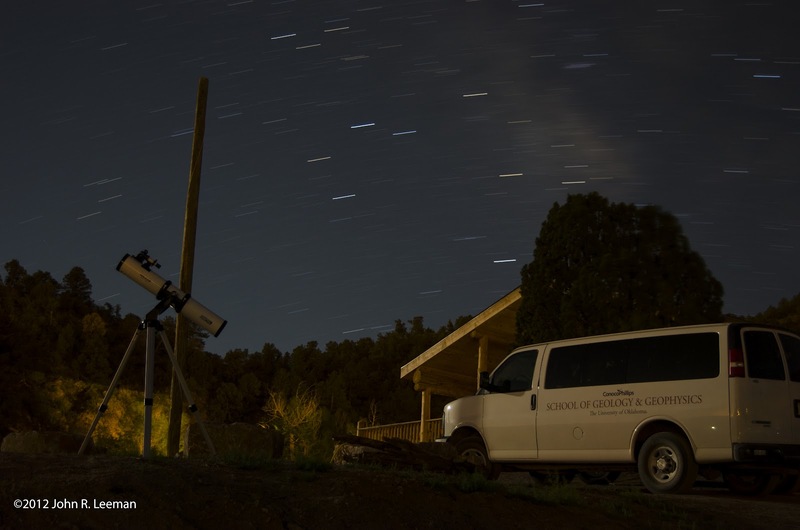 Expect more posts as we re-group in Cañon City, CO and begin working on gravity, magnetics, and ground penetrating radar. The final week of field camp consisted of a swap between geology/geophysics students, preparation of final reports, and a final presentation. For the first day (Monday) of the geology/geophysics swap I was helping the geologists with my homebrew resistivity rig. After some small problems in the morning the device cooperated, and we took a like across a fault, seeing massive jumps in conductivity over the gouge area. The second day I was actually out with the geology professors hand mapping some of the surface geology in the area. Tom and Neil were very instructive and were able to measure a strike and dip on things that very few would term 'outcrop'. Nonetheless the data plotted nicely! After the mapping came independent projects and final reports. Cullen and I decided to collect a gravity line across the dry union fault near Salida (the area of the first field trip). I ended up staying at camp to help the geologists process their data and Cullen went with Guang to collect the line. The results were stunning and the calculated fault dip angle is 87 degrees. Finally on the last day of camp we had to give a presentation of the results. Cullen and I talked for about 40 minutes and then there was much discussion between the faculty of our image. We had everybody excited about what we should try next year! Unless plans change it is likely that Cullen and I will TA next year. Now I'm at NASA in Houston, TX. Towards the end of this week I'll start a weekly post about the work here. It's very exciting work with a flying vehicle and guidance software. Stay Tuned! 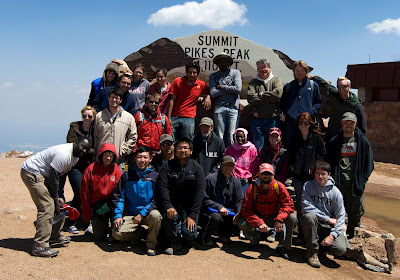 Below are a few pictures from the group trip to Pike's Peak. A copy of the final report can also be downloaded HERE. This week was seismic week for us here in Canon City. We carefully selected a site that crosses from sediment into basement, but the nature of the contact is unknown. It ran across the property of a nice couple who moved here from Iowa three years ago. They are interested in the geology and were more than happy to have us tramp all over with magnetic, gravity, and finally seismic gear including a larger thumper mounted on an ATV. The first part of the week involved Cullen and I working on a mounting system to attach the thumper for the four-wheeler. 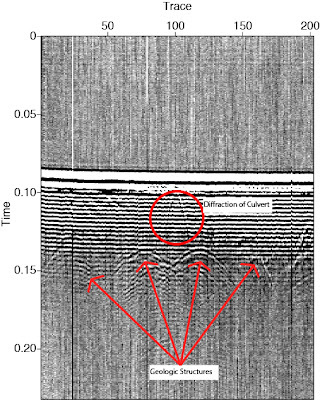 Seismic surveying works on the premise that different rocks have different wave velocities as a function of the type of rock, fluid content, etc. We set out a long line of geophones (basically a vertical seismometer) and then hit the ground very hard to induce a signal. 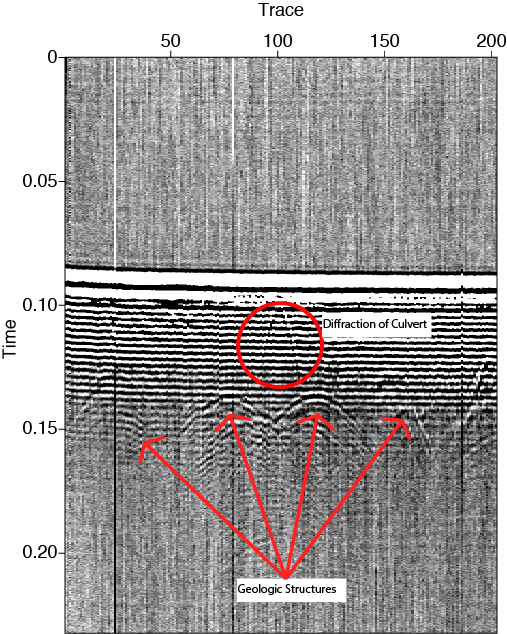 From the return of the signal we can learn a lot about what the subsurface looks like. For some surveys we hit the ground with a sledgehammer, shoot it with a gun, or even use dynamite! In this case we tried a new device that pulls a 40kg weight up with an electric motor and then drops it. There is also a giant rubberband that accelerates the weight towards the ground. There is currently a battle going on between naming the machine the seismic thumper device or the seismic thumper and utility device. We added weights, battery mounts, and even a flashing safety light to the four-wheeler. Before we could even use the thumper the control box failed due to a cable issue, so I had to rewire the control system (actually just a solenoid control) and mount the switch in a box on the ATV. It was a midnight patch up, but it worked well all day! The survey was laid out on Wednesday. The line was almost 750m long, then we even rolled it forward! Geophones were placed every 10m and the thumper was shot at each geophone three times to 'stack' the data (this helps us reduce random noise). We don't have any images yet, but tomorrow we begin processing. The line took a day to layout, a day to shoot, and tomorrow morning to roll up. Several long days for us here. I also put together a quick video of the thumper shooting. On a side note, we also took a great hike and field trip in the past week, so I've added a few photos of the Collegiate Peaks, and Tunnel Drive Trail. Week 1 has been very busy and week 2 is almost to begin. We were lucky with the weather, but this week looks to begin the inevitable warm up that we all knew would come. This week the geophysics group went on a field trip to get the regional setting (Monday), learned detailed surveying with the TOPCON differential GPS (Tuesday), conducted a gravity survey, and a magnetic survey (days dependent on group assignment). The week ended on Saturday with another field trip out west to see some different formations. The regional field trip went well and we scrambled across some slopes to see most of the section that the geologists would be mapping and be very familiar with. As a geophysics student I was more interested in the rock properties, what methods we could differentiate them with, etc. This trip did help put things in a big picture geologic perspective though. The differential GPS surveying went well despite a few equipment setup issues, which were to be expected with new users. The basic premise of the system is to leave a very precise GPS unit in place all day while another identical unit is used as a rover. The two data sets can then be merged using the base to correct for signal attenuation by the continually changing atmosphere and other error sources. In general sub-centimeter accuracy is achievable. This accuracy in elevation is especially important in gravity data processing since 1m makes .3086 mGal difference in the data. While some complain that taking 2 minutes to get a GPS fix is unreasonable I remind you that we are getting a very accurate position on an irregularly shaped rotating planet FROM SPACE... it's amazing it dosen't take longer. 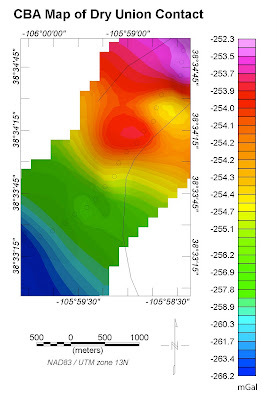 The gravity survey looks at density differences in the subsurface while the magnetic survey examines differences in magnetic susceptibility. We are interested in contracts between sediments and basement or with a dike especially in this area. After the processing I will post some results, but I know the magnetometer went crazy when I passed over the suspected location of a large dike. The gravity survey should also be helpful, but the gravimeter does instill a certain amount of fear in everyone since it is ~$100,000 and VERY easy to break. Omar is modeling the magnetometer in this picture. Finally, we went on another trip Saturday which involved me getting some nice rocks with chlorite in them for bookends from a tailings type pile in a field. This week will be seismic week, so stay tuned for updates and pictures of our new (hopefully) 700m long seismic line! The past few days have been working to get a solid radio link to downtown. The internet signal comes up on a 5.8GHz link, is distributed over a 5.12GHz mesh around the camp, and is repeated to others on a 3GHz haul over the canyon. Below is a picture of the stack at the top of the camp on the study hall. The repeaters are mounted on the sides of cabins. The current link is slow, but a new circuit will be installed downtown giving us a fast connection this week. Also included is a picture of the geophysics server (named thor) and the associated gear. We also worked on setting up the thumper. This is a machine that attaches to a trailer hitch of any vehicle (truck, ATV, etc) and impacts the ground with a great force. We use this in seismic imaging. Normally we use a sledgehammer for small surveys, but that can get tiring. For large, deep surveys explosives are used, this machine is a great middle ground. As you can see there is still some work to be done. Tomorrow the hitch will be modified and in the evening I'll be building some custom brackets and mounts for the controls and battery with Dr. Keranen. We'll use aluminium angle iron to build most of the mounts, pictures will follow. Tomorrow we all leave early for a regional trip to get the general geological/tectonic setting of the area. This trip will be both geologists and geophysicists. This is the first in a series of posts I'll be writing about my experience at the new Bartell field camp. 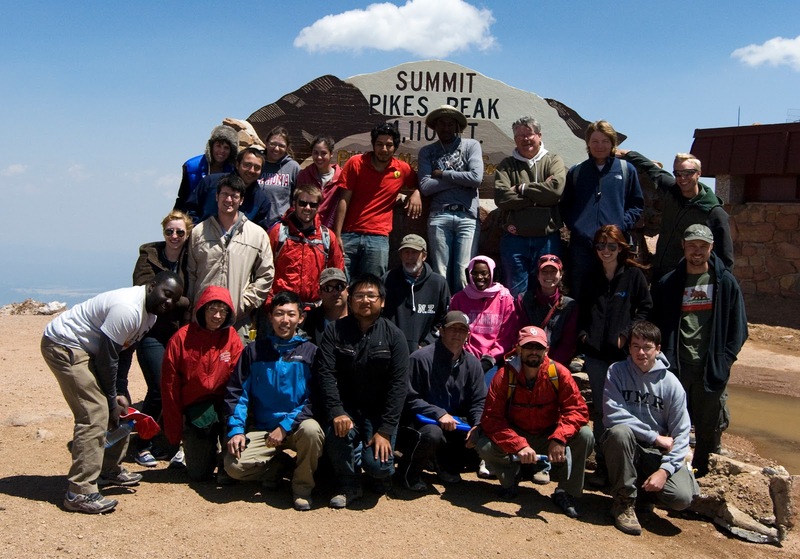 This camp will serve as the base for summer geology/geophysics students. Geologists will be here 5 weeks, geophysicists 3 weeks. I arrived early to setup computer equipment and help get things going around the place. I arrived Wednesday and unloaded the server, 10 laptops, associated wiring/network components, and my field gear. More on the setup in the next post when we have internet and the rest of the network up and running. The first night here the freshman field trip was also at camp, spending the night before departing to Dalhart, TX. We all hooked up the projector, hung a sheet, and had a movie night in the dining hall (complete with popcorn). The movie was 2012, one of the better geological comedies if you ask anybody there. The camp site is beautiful and my cabin is at the top, affording the best view. This view comes at the price of walking a VERY steep trail, and at 6,200 ft. it's easy to get a bit winded. After a couple days it is not a problem though. So far the weather has been very cool and rainy in town, but fairly dry up at camp. It's hit freezing at night making a sleeping bag necessary in the cabins. The peaks off in the distance are still snow covered, but today were obscured by rain shafts. Stay tuned for a tech update tomorrow and then the arrival of the rest of the crew on Sunday. The next few weeks should brings lots of interesting field work and interesting results.